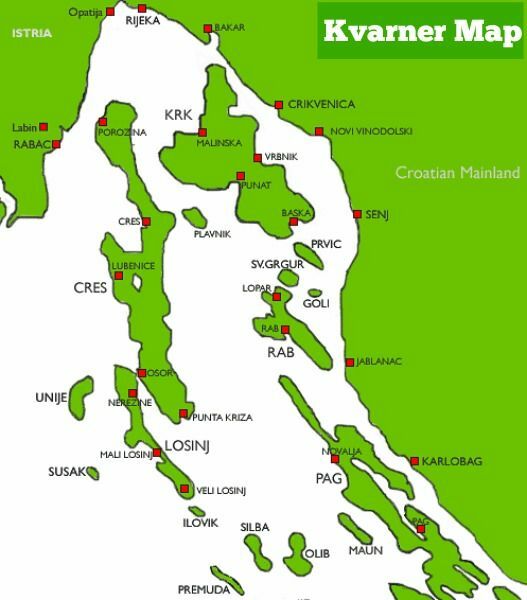 Map of Kvarner indicates the huge gulf in the northern part of Croatian Adriatic coast nested between Istria peninsula and Northern Dalmatia coast line. The capital of the region is Rijeka (Fiume in Italian) and also the biggest Croatian port. Heading along the coast only 39 Km from Rijeka, Kvarner capital, you’ll run up against two beautiful Rivieras. The first one is a series of small towns (Jadranovo, Dramalj Crikvenica and Selce), better known as Crikvenica Riviera. The second one as a natural continuation is Novi Vinodolski Riviera that consists of small villages, Novi Vinodolski, Klenovica, Povile, Breze and Bribir. Novi Vinodolski was a home town of aristocratic Frankopan family that ruled these parts. Several of the largest islands in the Adriatic Sea, belong to this region. Krk island has been considered as the largest island on Croatia’s Adriatic coast, but recently has been discovered that neighboring Cres island has the same surface. Krk island is the closest Mediterranean island to Western and Middle Europe, connected with the mainland by bridge. Krk island airport can receive the largest air crafts managing both, domestic and international flights. It’s only 30km from Rijeka, which is also served by railway connections with Italy, Austria, Germany and Hungary on a daily basis. Another island of the same size is Cres island, very close to Istria coast, connected with very frequent car ferries. If yo visit this island you’ll notice the two faces of the island. The northern part is rather rocky and hilly while the southern end has more flatter landscape, more wooded. This part is also connected with a small bridge to the island of Losinj. From my personal experience while Cres has a wild perception, the island Losinj (with two villages, Mali (small) and Veli (big) Losinj is the most attractive holiday destination. This island has also connections with Venice by fast catamaran boats, during the high season (May to September). Rab island is the third island on the map of Kvarner bay, covered with evergreen forests and my favorite destination. The capital of the island, Rab (the same name as the island), boasts a long history that dates back to the year 10 BC, when it is mentioned in an old Roman document from the period of Roman emperor Octavian. This romantic town has four churches bell towers and if you are approaching the town by boat, from the distance it looks like a ship with four masts. Very impressive.